Fitted style. 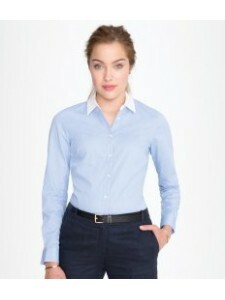 Narrow classic collar. Self colour buttons. Back yoke. Bust and back darts. Single but..
Fitted style. Chambray weave. White contrast classic collar. White buttons. Back yoke. Single button..
Fitted style. Yarn dyed stripes. Button down collar. White buttons. Back yoke. Bust and back darts. ..